There are still some who remember what it feels like to have your entire world shattered overnight. 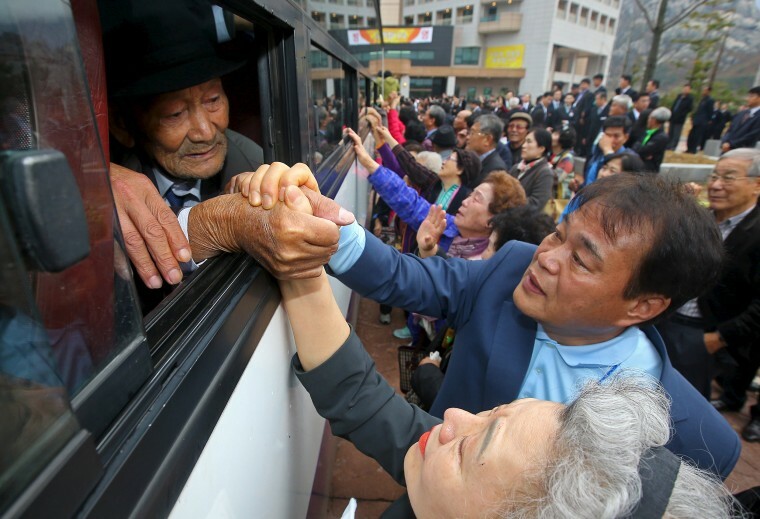 These Koreans have waited decades for peace. Whose face comes to mind when one thinks of North Korea? For many, it’s likely Kim Jong Un, the nation’s current leader. For some, it may be a refugee, perhaps seen on the news or in promotional materials distributed by human rights groups. I, however, cannot think about North Korea without seeing the faces of my late grandfathers, who were forced to leave their families and homes behind during the Korean War. In the aftermath of Trump and Kim's high-stakes summit, my ancestors’ faces have never been far from my mind. My grandfathers were among the countless Koreans who were separated from their families as a result of the war. Among them, less than 60,000 South Koreans survive today, and the majority of them are in their 80s or older. For those who left their families and homes in the north, they harbor intense guilt. It is not known how many of their counterparts survive, but it is clear that their numbers are dwindling. For these families, the contradictory and inflammatory rhetoric of two of the world’s most mercurial leaders is not simply a matter of political gamesmanship. For these families, the North Korean standoff is part of an acutely personal — and painful — history, which feels absurdly absent from much of the American coverage of both this summit and the inter-Korean summits. For these families, the North Korean standoff is part of an acutely personal — and painful — history, which feels absurdly absent from much of the American coverage. Im Jong-soon, my paternal grandfather, was born in 1932 in the city of Kaesong. When the war began in 1950, his father told him to flee south to avoid being drafted by the North Korean army. And so he did, leaving his parents and the life he knew behind but still expecting to return eventually. He would never see them again. My father still remembers watching Grandfather Jong-soon drink soju and weep during Chuseok (Korean Thanksgiving) and Seollal (Korean New Year), each holiday a painful reminder of the parents he had left behind. Cho Bu-jun, my maternal grandfather, was born in 1928 in what was Yeonbaek county. Before the war, he had freely crossed over the 38th Parallel several times. When the war began, however, he was in the south and could no longer return home. He never even said farewell to his parents and siblings. Unlike Grandfather Jong-soon, Grandfather Bu-jun had no relatives in the south, so he was alone. Years later, my mother recounted him going on trips with his friends to the Korean Demilitarized Zone (DMZ) so he could feel closer to his family and home. Grandfather Bu-jun passed away in 2011, and Grandfather Jong-soon followed in 2014. One cannot blame those who still remain for being hopeful about the outcome of the summit, especially since Kim and South Korean President Moon Jae-in agreed back in April to organize a reunion of families divided by the war. The last reunion occurred in 2015. Only 20 have taken place since 2000. And, of course, should Korean reunification ever occur in the near future, imagine what that could mean for these families. I too am hopeful for peace between the Koreas, though not without a healthy dose of pessimism. And yet, I fear the window for true reunification, the reunification my grandfathers’ generation deserves, may have already closed. Younger generations of South Koreans are increasingly skeptical of reunification, putting them at odds with my grandfathers’ generation. Families divided many years ago are losing the familial ties that used to bind the two countries together and kept the memory of a unified nation alive. Families divided many years ago are losing the familial ties that used to bind the two countries together and kept the memory of a unified nation alive. In 1983, KBS (Korean Broadcasting System) aired a live broadcast program called “Finding Dispersed Families,” which sought to reunite separated families in the south. It aired for over 453 hours over the course of 138 days. More than 100,000 people applied to be reunited, and of those, 53,536 people appeared on air. Through the broadcasts, 10,189 families were reunited. The emotional footage of ordinary citizens seeing their family members for the first time in three decades swept through the country. Neither of my grandfathers applied for the program. Grandfather Jong-soon had received word that his parents were still in the north before the fighting ceased. They were already old, so he reasoned they had already passed. Still, he watched the broadcasts, and while he never cried, my father knew it was cathartic for him. The world certainly needs a peaceful resolution to this diplomatic standoff, but these families also deserve their own peace. Grandfather Bu-jun presumed he was the only one from his family living in the south. However, while those broadcasts were airing, he gathered my mother and her siblings together. He told them the names of his siblings — his older brother Cho Hong-jun and older sisters Cho Gan-nan and Cho Ttol-ttol. He said that if he died before “our country” reunited, he wanted his children to locate them. While too late for my own grandfathers, I do hope that the summit yields positive results and that Korean reunification happens sooner rather than later. Because while younger generations did not have to live with the trauma of the war, there are still some who remember what it feels like to have your entire world shattered overnight. These Koreans, whose perspectives are so rarely represented by the American press, have waited decades for peace. The world certainly needs a peaceful resolution to this diplomatic standoff, but these families also deserve their own peace, which they have craved for so long. Jun Im is a contributing writer. He was born in South Korea and moved to the U.S. in 1995.